The Tanza sandal from Teva stays secure through water, sand or grass. The patented universal strapping system means the adjustable hook-and-loop strap holds the foot securely while allowing for a perfect fit. The molded rubber sole provides loads of traction on wet or dry surfaces, and an encapsulated shock pad in the heel ensures shock absorption. Following in the footsteps of Teva's other sports sandals (no pun intended), the Teva Tanza was built to perform in the water. Featuring Teva's universal strapping system with 3 points of adjustment, as well as Shoc Pad technology, this men's sport sandal makes for easy walking on the river bed. An EVA topsole with Microban zinc offers anti-bacterial protection. The compression molded EVA midsole offers all-day cushioning. 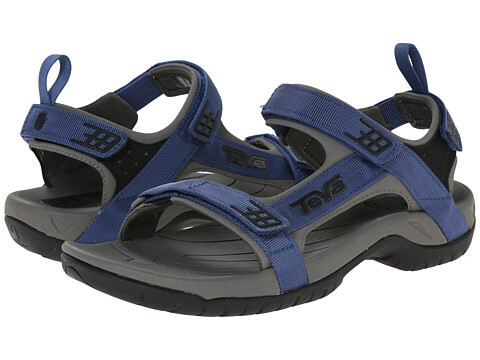 This Teva sandal also has a Spider Rubber outsole for grip in wet environments. In water or on land, the Teva Tanza will never fail you! Size: US 11,12,only - NO other sizes available.